Losing weight has been incredible. Periodic Table said to me yesterday," Baby, this has been the best money we ever spent." I couldn't agree with him more. With each pound I lose, I'm finding myself more and more. 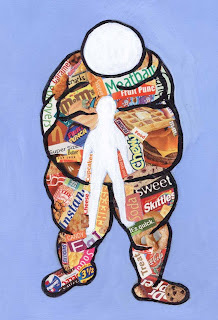 The excess weight was keeping from being the person that I wanted to be, but I just didn't realize just how much it was suffocating the life in me. It's just now that I am peeling off and discarding these layers that I can actually see how it affected me. Just yesterday, The Kid was under the table at a restaurant, and without thinking about it or skipping a beat, I jumped out of the booth, quickly squatted down, and promptly put his little behind back in his seat. It was only when I had been comfortably back in my own seat for a minute that I said to Headlights, " Damn, I wouldn't, couldn't have done that before I started losing weight, friend." I just hit me. I spent so much energy bearing the physical and emotional tonnage of corpulence, that I was depleted when it came time to put the energy into my family or even myself. My nails, while chipped and in desperate need of a do-over, are polished for the first time in years. Jewelry that was once collecting dust now adorns my ears, arms, and neck again. Little stuff that I never thought about NOT doing, I find myself effortlessly doing. This VSG and the changes that it's brought into my life so far are unbelievable.